I told him that they were all wrong. Then, of course, I had to explain to him the correct way to measure CRM. That is what I will do in this article. All of these things can be measured. You build a customer database and compute what they were last year — defections, average order size, number of orders per customer per year, etc. Then you measure what they are this year. If CRM is working, most of them will be better. How can you use CRM to make them better? That is where most CRM proponents don’t have a clue. They mumble something like “Make the right offer to the right person at the right time”. How do they expect to do that? How do they know what the right offer is for Arthur Hughes, and when to send it to him—and how do they even know that Arthur Hughes is the right guy? They really don’t know any of these things (no one can!). To make up for this lack of knowledge, they build a huge data warehouse crammed with all the information that they can assemble about all their customers, prospects, products, promotions, sales, events, balances, costs, etc. Then they spend a lot of money on super “drill down” software that will, somehow, discover from the data in the warehouse what is the right offer to the right person at the right time or RORPRT which, I guess, is pronounced roar-pert. Why can’t they find RORPRT in their warehouse? Well, think about it. Your wife dragged you to a men’s clothing store last weekend, and you bought a pair of slacks and a couple of shirts. Did the data in someone’s warehouse indicate that you were going to do that? You didn’t even know it yourself. Your wife wasn’t even sure that she was going to be able to persuade you to go. So, if you didn’t know it, how was the warehouse supposed to know? The same reasoning applies to your purchase of a vacation home in Florida, or summer camp for your daughter, or your choice of a new dentist. Most purchasing decisions are made by people exercising their free will. No one can predict what Arthur Hughes is going to do next weekend. What you can predict, however, with some precision is that of the 10,000 people in Arthur’s segment (over 65, good income, graduate education, travels often) that 8% (800 people) will take a cruise in the next year. Arthur may never take a cruise. But those 800 will cruise, and you can take that to the bank. You just don’t know which of the 10,000 people they are. Is this CRM? 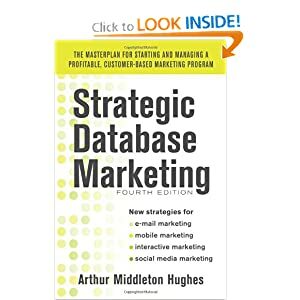 No, it is database marketing to customer segments. You don’t need a huge data warehouse. You just need a customer database with enough data to create and measure the performance of customer segments. How do you get these 800 people to do what you want? The answer is that you communicate with them. You send them letters or newsletters and emails. You do mass advertising on TV or radio, or the press asking them to call an 800 number or visit a web site. In the right situation, you may even call them on the phone. You use the database to keep track of what is working and what is not working. You use the communications, plus the database, to increase sales, cross sales, reactivations, referrals, etc. You set up control groups that do not get the letters, newsletters and emails to make sure that what you are sending is working. You use Excel spreadsheets to prove to yourself and to management that you are influencing customer behavior in positive ways that will boost your profits. – And that is how you measure CRM.